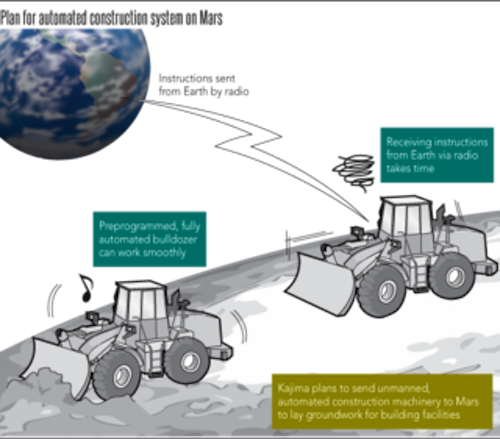 TOKYO -- Japan's Kajima plans to develop fully automated construction machinery for building facilities on Mars and the moon for long-term human stays. The major Japanese construction company will team up with Japan Aerospace Exploration Agency (JAXA). The machinery should be ready to build a facility to accommodate four to six people on the moon in around 2030 and on Mars in around 2040. The new machinery will utilize Kajima's already-tested auto construction system, called A4CSEL, or Automated Autonomous Advanced Accelerated Construction System for Safety, Efficiency, and Liability. The system allows human operators to give instructions to machinery via tablet computers. Bulldozers use GPS and accelerometers to perform a variety of tasks. The system has already been used to build dams in Fukuoka and Oita prefectures in southern Japan. Kajima equipped Komatsu's networked bulldozers with its machine control program, which was based on data derived from experienced machine operators. Such machinery is capable of carrying out work with high precision, Kajima says. But if machines simply follow orders, they may fail to respond adequately to unintended accidents or duplication. To solve this problem, Kajima plans to develop a new way of operating machines that allows them to communicate with each other to do their jobs more efficiently. Machines will, for example, detect their own location and make adjustments so as to avoid collisions or repeating a task such as piling dirt. Kajima thinks its new automated construction machinery will be useful in leveling the ground before constructing a rocket launch pad or a building. It is also expected to be used for carrying dirt. Satoru Miura, principal researcher at the Kajima Technical Research Institute, said the company will develop the new construction machinery for use in civil engineering works. "If we succeed in building automated machinery, we can transfer the technology to engineering works on the ground," he said. The International Space Station, the furthermost man-made structure from Earth, was built by astronauts assembling, with the help of controllers on the ground, materials brought by the Space Shuttle and other means. Although no ground leveling or other engineering work was needed because it is in space, it took 13 years to complete the construction, starting in 1998. 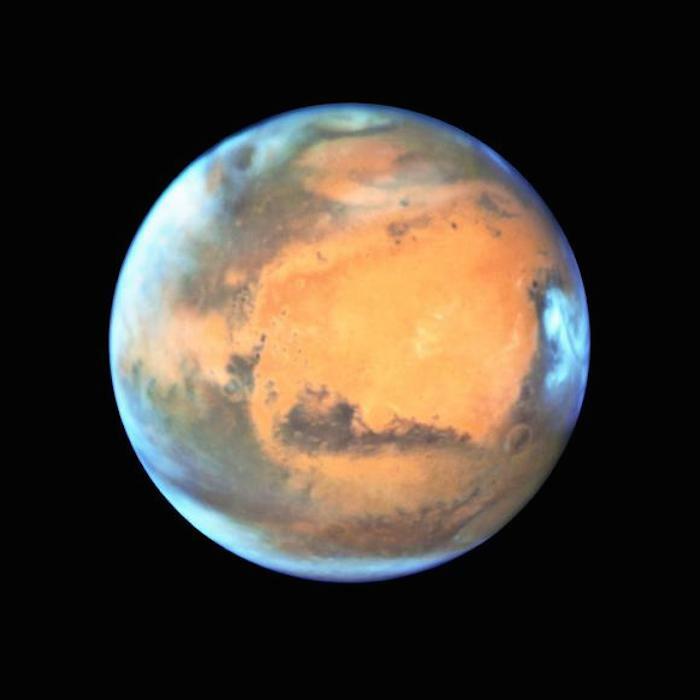 Construction on Mars or the moon will face a different challenge. Since those celestial bodies are away from Earth, it takes a long time to send radio signals. Thus, auto construction by remote control is not a realistic option. Sending humans to do the job may be possible but accommodation during the construction period will be a concern as it will take a long time. In January, JAXA selected Kajima's idea to develop machinery for construction in space for its Space Exploration Innovation Hub project, a three-way program among businesses, the government and academia. An indoor experiment will be held sometime after April next year at JAXA's Sagamihara Campus in Kanagawa Prefecture, south of Tokyo.